In anticipation of the Derby della Madonnina tomorrow, let's take a look back at Gianni Comandini. This article originally appeared on this blog in January 2012. "I perhaps visited doctors who cared more about sporting results than my health [...] People think football is only about training and matches, but it isn't--like almost any profession, there is a lack of transparency." And there they were--words more transparent than the business of football from a man who proves, even to this day, un-transparent. Gianni Comandini is a man whom Inter fans want to forget; he is a man whom Milan fans will never forget; he is a man whom football has all but forgotten. But let's remember. The date is May 11, 2001, and Carlo Pellegatti and Tiziano Crudelli are priming their larynges for the Milan derby. There is nothing to play for, and there is everything to play for. There are five games left in the season, but Milan and Inter, level on points, are twenty points behind a Roma side moving closer to their first Scudetto in eighteen years. Almost destined for the UEFA Cup, the two clubs from Milan know that only winning the derby really matters for the season. Cesare Maldini, caretaker manager of Milan after the sacking of Alberto Zaccheroni, decides to field the dependable striker Andriy Shevchenko alongside Comandini in attack. A midfield of Gennaro Gattuso, Federico Giunti, Kakhaber Kaladze and Serginho supports the duo in front of a defence comprised of Thomas Helveg, Alessandro Costacurta, Roque Junior, and Paolo Maldini. A 36-year-old Sebastiano Rossi guards the goal. Looking at that Milan line-up more than a decade later still causes pause for thought, and not just because Roque Junior is in the defence. It reminds Milan fans like me how well we were covered on the left side of the team. Serginho, Il Concorde, could play either at left-back or on the left flank of midfield, but Zaccheroni could use his pace and incisiveness further up because he had the peerless Maldini to count on at the back. That team may have had deficiencies, but the link-up play on the left was not one of them. And it is to that dynamism that Comandini owes a large part of his odd renown: scoring only two goals for Milan during his one and only season, and scoring them on that very day of the Milan derby. Well taken goals, too. In the third minute, Inter's Matteo Ferrari tries to clear the ball, but Maldini intercepts it near the middle of the field for Serginho to burst forward. Two defenders make for the Brazilian, who dissects them with a ball for Comandini in the penalty area. Comandini receives the ball with his back to goal, but nonetheless swivels before putting it past Sebastian Frey. His subsequent celebrations momentarily dissipate his agony; he finally makes his mark on the club who bought him from Vicenza at the close of the previous season. But it gets better. In the 19th minute, Serginho, finding for himself a luxury of space, crosses for Comandini to head home from a tight angle. This time the celebrations are only slightly less subdued, as he is gradually mobbed by teammates. And then it only got worse--for Comandini, that is. Of course, Milan would proceed to flatten Inter 6-0 (see video below) with Serginho instrumental in the annhilation, but Comandini would move to Atalanta the following season, where he would score seven goals in four years. After Atalanta his career lurched to Genoa and Ternana, before he finally retired in 2006, due to a peristent back problem. He was brought to Milan to form a prolific pairing with Shevchenko, but instead he is remembered as almost a cult-hero by Milan fans, a player who only got going when it mattered most. Tinged with tragedy is the fact that those two goals were probably his most high-profile moments because they came in one of Europe's biggest derbies; however, he, understandably, refers to his other achievements as being more memorable. "People remember me most for those two goals," he said in the summer of 2006. "But really the best year for me as a player was when I ended up as top-scorer [20 goals] with Vicenza in Serie B, and when I won the Under-21 European Championship with Italy the summer before I came to Milan." And yet, even yours truly, chooses Comandini's two goals as a portal to glimpse at the man. I do that not because his career is obscure to me, but because those two goals distill in a kind of fleeting moment, a what-could-have-been moment in his career. That day stands out more than, say, how he played with Nicola Ventola for the Italy youth side. And then there were the injuries, the moments you never want to remember about a player. Comandini is slightly dispassionate about what happened, a distance that undoubtedly gives him comfort. "I had had two back surgeries, and my back was still not better in the long-term," he said in an interview last year. "I realized at the age of 28 that my performances were declining." 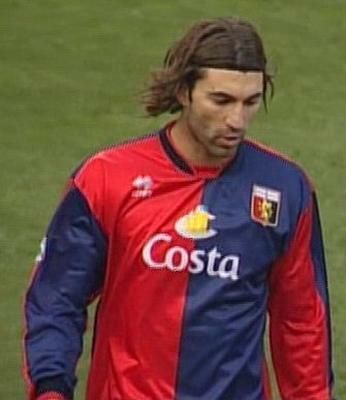 A career that started at Cesena and spanned Vicenza, Milan, and Genoa faded in Ternana almost six years ago. However, Comandini sought out a new beginning by starting a restaurant in his native Cesena. He also plays football at the amateur level. Rather than rue what could have been, he remains philosophical, accommodating his premature retirement as an opportunity to start a new life. "When I was suffering through my injuries, I came to a realization that it was time to change," he says, reflecting back on the last days of his professional playing career. "I wanted to see what was outside of football." fond memory. that was NOT Milan's best game against Inter (honestly!) but you certainly can't complain about the scoreline. It is nice to watch Maldini & Costacuta in action. Serginho and Sheva. Great. Very emotional. Nice tribute to a player that most will have forgotten. I remember an Italian friend telling me about Comandini when he was in Atalanta and assuring me he was the next big thing. Ventola was another that never really made it.